Lock in a great price for Water Wheel Inn – rated 8 by recent guests! The location is a little bit out of town, but I loved the quiet location bordering a golf course. The rooms are comfortable and quiet. The front desk staff (owner) was so nice and friendly. Great price in off-season. Sparkling clean, super comfortable bed and pillows, individual heat / ac, nice water pressure, good breakfast (HB eggs, oatmeal, toast, waffles, etc.) 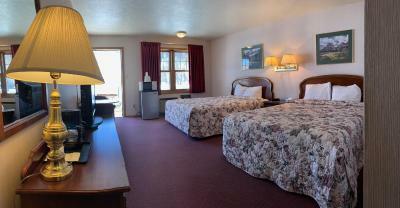 Good location just a few minutes from center of Gunnison. Recent renovations make the place feel new. Great value, would definitely stay here again! Great place to stay period. Large rooms. power plugs outside on porch, Great breakfast and amazing staff. Welcoming staff. Good breakfast selection: hard boiled eggs, yogurt, breads, bagels, bananas. Rooms were clean and large. Large area outside for walking the dogs. Peaceful, couldn't hear any traffic noise at all. Luvly area. 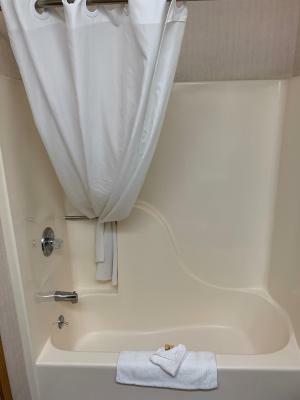 We liked everything about the place from the friendly staff, the yummy free hot breakfast, cozy bed, nice patio to enjoy the beautiful golf course and changing leaves right outside our door, closeness to town! This is an older property, but was clean and accepts pets. Front desk staff very friendly. Enjoyed the friendly staff. One of the maids had let us know that the ponds around the property were stocked with fish. Very relaxing place. Loved the little balconies. We will be back. We loved being able to walk out of our room and watch the golfers and workers on the golf course. We saw deer in the evening. We went for a walk after the golfers were done. The staff was extremely friendly. Bear went out of his way to be extra accommodating. Went above and beyond. Water Wheel Inn This rating is a reflection of how the property compares to the industry standard when it comes to price, facilities and services available. It's based on a self-evaluation by the property. Use this rating to help choose your stay! 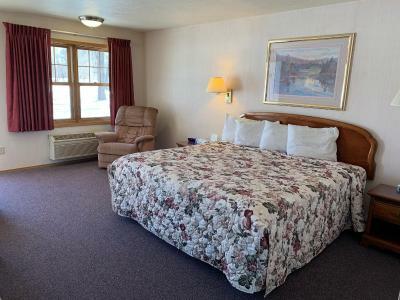 Offering a fitness center, this motel is 10 minutes’ drive from Western State College. Free Wi-Fi access is available in all guest rooms. A free hot breakfast is served daily. 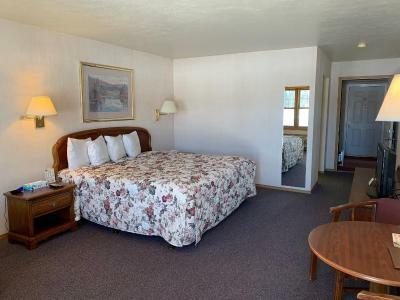 A seating area with a work desk, a cable TV and an private bathroom equipped with a hairdryer is included at Water Wheel Inn Gunnison. A microwave, a small refrigerator and coffee-making facilities is also provided. Select rooms offer a full kitchen with a dishwasher, a refrigerator and an oven is also provided. Guests can take advantage of barbecue facilities at Gunnison Water Wheel Inn. Free parking is provided. Gunnison Pioneer Museum is 5 minutes’ drive from the motel. Blue Mesa Reservoir is 22 mi from Water Wheel Inn. Crested Butte Ski Area is 34 mi from the property. When would you like to stay at Water Wheel Inn? 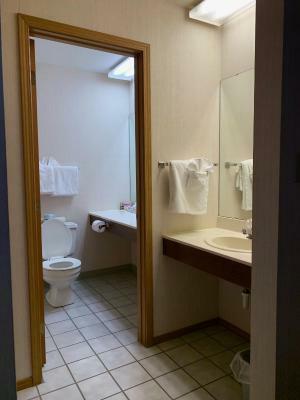 This air-conditioned room includes a cable TV, a work desk and an private bathroom. A microwave, a small refrigerator and coffee-making facilities are also provided. House Rules Water Wheel Inn takes special requests – add in the next step! Water Wheel Inn accepts these cards and reserves the right to temporarily hold an amount prior to arrival. I had a great stay and have no complaints. More breakfast options? Otherwise fantastic! The breakfast was in office building, so in winter to get there the warm clothing is needed. Found a hair in bed. Had booked a KING Room and a QUEEN Room back in February. Moved into the Rooms (my Mother was in the Queen Room), had unpacked, toiletries in the Bathroom, things in the Refrigerator, then Reception rang and said we had to move as dogs weren't allowed in this Room. I said I had booked in February, had confirmation that I had pets, but because it was through a third party (Bookings.com), obviously that message wasn't passed on. We had to pack everything up and also move my Mother as she needed to be near us. We got a QUEEN ROOM - husband doesn't fit in a Queen bed, too tall. Reception lady was nice, offered to help us shift and gave a refund of the difference of the room. Bed was hard. Wifi did not work. Bed was uncomfortable, but ok for one night.